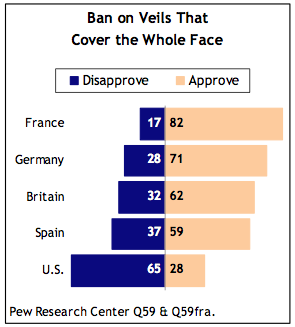 Ideologically, those on the right in France, Britain and Germany are more likely than those on the left to approve of a ban on women wearing the full Islamic veil in public places, but majorities across the political spectrum in these countries endorse such a ban. 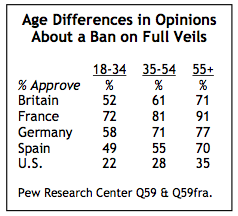 In France, 87% of those on the right support prohibiting women from wearing full veils in public, and 75% of those on the political left agree. 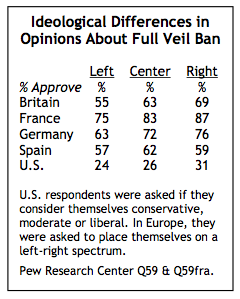 Spain is the only Western European country surveyed where those on both ends of the ideology scale express nearly identical views; 59% of those on the right and 57% of those on the left approve of a ban on Muslim women wearing veils that cover the whole face. Ideological differences are also insignificant in the U.S.